You get battle-weary of these phenomenon. The stream of jubilees, weddings, babies, marriages, divorces, and minor incidents is relentless. If they’re not dying they’re being born. And we haven’t even got to Harry and Meghan yet which is going to make Charles and Diana’s do look an exercise in restraint and frugality. Yesterday as St George, Brexit and Royalism combined into a spasm of Anglo-British nationalist fervour, the feeling of ‘Britain’ as a sort of queasily sycophantic place of exceptionalism was overwhelming, and the optics weren’t exactly great around this pitch by Corbyn, even if the intention might have been good. The whole thing needed a Trigger Warning for the Rational and the Republican-minded everywhere. 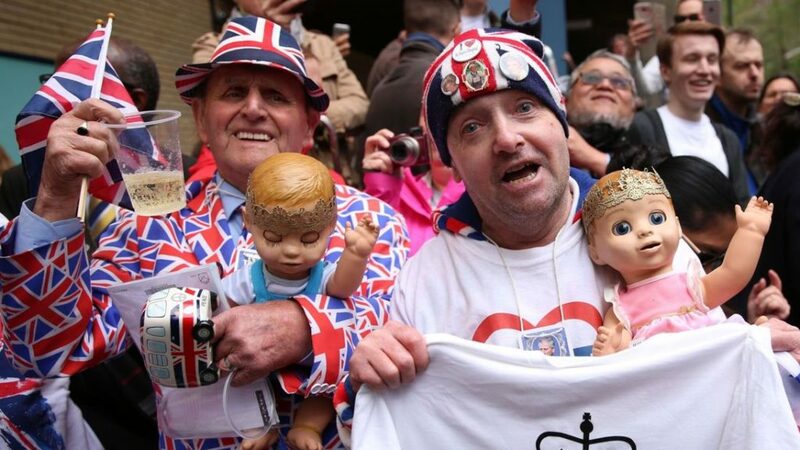 It’s important not to be consumed by the spectacle, but the sense in which the Windsors act as an enabler to a state of abject stupor is clear. We’ve gone from the memorably low-bar ‘UK:OK’ to imagining Britain as a sort of divine force in the world, and the Royals are the trick that makes that particular fantasy plausible. Opposing ‘Brexit Britain’ has now become a red-line for the miasma of national unity and the parody of negotiation that May and her cohorts are faking. The ‘National interest’ has become synonymous with the Brexit deal, and England’s hard-right vision of that process. But what are offered as an alternative? Federalism and more bunting. Just as you think that the British crisis is exaggerated or overblown, it emerges that Theresa May’s ‘Hostile Environment’ immigration policy was compared to ‘Nazi Germany’ by her own ministers, and the BBC operated its own vetting practice by MI5 for decades. As the extent of the state control is revealed, so too is the reality of social breakdown that has quickly become a normalised part of everyday culture. As a report indicates a 17% increase in Foodbank use in Scotland to an astonishing 170,062 three-day emergency food supplies to people in 2017-18, the idea of more palliative constitutional tinkering seems distasteful at best. In wider Britain, it’s reported that at least seventy-eight homeless people died on the streets and in temporary accommodation this winter, bringing the number of recorded homeless deaths to more than 300 since 2013. The number of recorded deaths of homeless people has more than doubled over the last five years, rising from 32 in 2013 to 77 in 2017. The Bureau of Investigative Journalism reports that: “A former soldier, a quantum physicist and a 31-year-old man mourning the loss of his mother and brother were among those found dead in doorways, crowded shelters and tents pitched in freezing conditions since October last year” as if peoples age or careers matter. In the debris of this social breakdown, the institutional racism of the British State is being exposed day after day. Beyond the tragedy of Grenfell Tower and the Windrush revelations (that nobody seems to be responsible for), the nature of British society is laid bare. If all of this has combined to create a less than rosy-glow about just what kind of country Baby X is being born into, perhaps its inspiring some genuinely radical solutions to break through the madness and the dysfunctionality? This week we were told that a “furious row” had broken out between Richard Leonard and Jeremy Corbyn. “Leonard isn’t the first Scottish Labour leader to agitate for reform. Johann Lamont famously quit over interference from London, while her successor, Kezia Dugdale, announced plans for what she called (to great derision) “a new act of Union”. This badly-botched branding essentially killed off Dugdale’s proposals and, with them, any discussion of the merits of federalism. Since then, for roughly two years, both sides have retreated into tribal comfort zones. And that’s a shame, because the pro-independence part of Scotland lost a useful opportunity to have a level-headed debate about the nature and limitations of the British state. For many people, simply invoking the word federalism is enough to sound radical. And, in one sense, it surely is, because Scottish political life has been so badly disturbed by tribalism that any attempt to define a middle ground is a bold move. Radical? Perhaps. Brave? Definitely. Boyd forgets Gordon Brown’s own vague and forgettable enthusiasm for Federalism that peaked in 2014 and quickly slipped away in 2015. The recurring bad dream does little to overcome the same arguments that were understood in the early seventies. Here’s why Federalism won’t work. There is little motivation and zero agency to change from England, or we would have a meaningful movement Taking Back Control right here right now. This is essentially an exercise in misdirection as much as cooing at a baby Prince or throwing dead haddock into the Thames. Nothing resolves this. Not another interminable Constitutional Convention, not another endless debate re-treading the same arguments. Britain is a centralised surveillance state. We remain subjects not citizens and will remain so as long as we are tied to this madness. What we need to give birth to is a Scottish Republic that can take its place in the 21st C.
Way back when Gordon Brown was talking Federalism commentators like Martin Kettle got very excited [“Gordon Brown is right: federalism is on its way if the Scots shun independence”]. But that social union, that social contract is broken. And the void between the brutalism of austerity Britain and the vague mutterings of Richard Leonard’s team is chasmic. That is a very very disturbing picture. Had slipped indoors yesterday afternoon for a cuppa and switched on the TV to the News Channel which was broadcasting ‘live’ from outside the hospital when right in front of the hospital one of London’s many homeless people passed along pushing all his worldly goods in a super-market trolley. Checked later in evening news and he had been edited out – hope they offered him appearance money, LOL??? As for Federalism, Collins and DeVelera told them in 1921/22 that it would never work for all the reasons repeated every few years when this daft idea surfaces. The only reform we are likely to see from the British state is perhaps,maybe,possibly only broadcasting royal/war commemoration events once a year and promising faithfully to give parliament a say in future on who they are going to bomb next (that will be right). A feudal state cannot survive without centralised control and that is what they are intent on preserving at all costs. That is why we are now seeing a blatant effort to dismantle the powers currently residing in the devolved nations. The EU has thwarted this Tory desire by making them accountable to European law but post Brexit,they will be unleashed and feel they are masters of all they survey and can do as they like (Royal prerogative,1066 and all that). And they will,if we let them. Tis with great joy that I learned of her HRH being tucked up in the £7,500 per night private wing of the St Mary’s NHS Trust Hospital safe and sure with the attendance of some twenty expert physicians on hand. We must surely cut our deepest veins and endure the greatest hardships to ensure the continuance of our Royal line. God save the Queen and all who fall after her. Her loyal servant Willie. It makes me so proud how we can come together in the support of her majesty. A union consisting of four units – England, Scotland, Wales and Northern Ireland – would be so unbalanced as to be unworkable. Federalism or union; both statements are true. Decisions by Westminster are never about what Scotland, Wales and Northern Ireland want, not even collectively. All three can be out-voted by what England wants. If the numerical supremacy wasn’t enough it can be seasoned with some EVEL and Great Reform Bill to make the taste truly abhorrent. Erm, that should have been Repeal, not Reform (or EU Withdrawal Bill to give it the new, more cosy title). Fortunately I had the good sense to give up on the propaganda tax in 2014 so do not suffer the nauseating fawning and gibbering of BBC presenters or the lobotomised idiocy of Mrs Windsor’s grovelling subjects being interviewed. But what to do about it, it’s too late now. As much as I enjoy reading these pieces on the colossal f*ck up we are in, all the writing in the world will change nothing. Bellacaledonia is a great site, with some excellent reporting and opinion pieces but it’s read by the converted. The best option, if you can, is to emigrate.